New 2018 Defender XMR HD10, Great machine, brought her home today! Traction in the deep snow is outstanding with the lockers. First upgrade, installed the larger fender flares. Helps a lot with the overspray. Next upgrade in three weeks, is the can-am full hard cab and heater. Rear bumper with winch. I will be building an aluminum topper, similar to the Pro-Fab toppers. It will house my Honda generator (no more froze up generator), and wired to supply power to the fish house, and haul all the gear. Full rack over the cab and topper to haul the portable hub-fish house, and skis for the wheel-house. Later summer she will be getting tracks with studs. Not sure which ones yet, Apache, Camoplast, Trex, Mattracks, Apache Backcountry, ......... I have Camoplast on my wheeler and work good, just need to do some research on the others. I will post pictures of the progress. Last edited by willyg1997; 03-28-2019 at 09:21 PM. Which flare are you using? Following as I want to know if you are going to upgrade springs or not for the Boss V-Plow. 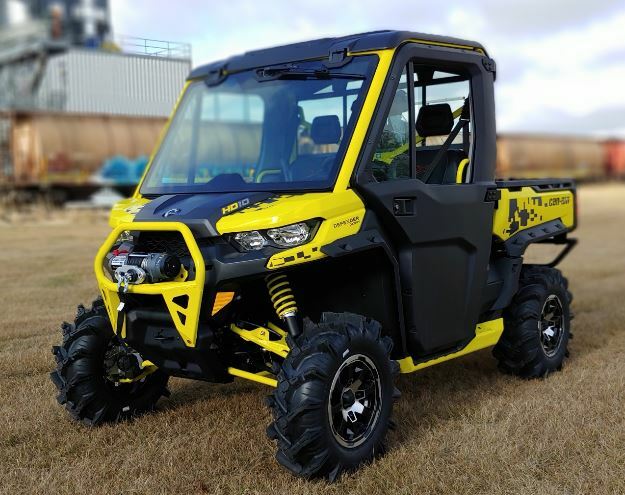 I'm headed down this path as well now that the wife is working she wants one bad not sure if it will be the XMR or the Cab XT. Anyways good luck and look forward to follow you. Not sure yet on the springs. With them cranked up it is pretty stiff, time will tell once I get the 400# plow on. For the past few months I was stuck on either the XMR or the Cab XT. The deciding factor was the smart-lock on the XMR ($1500 upgrade for the XT), and the rear full-time locker. Plus a 15% discount on accessories with the purchase of the new Machine. So, with the 15% off the accessory Full Cab and Heater I was able to snuggle in on the XMR Cab with front and rear Lockers for a lot less $$ then a full Cab XT. Plus it has a better suspension, higher front winch, rocker covers, not to mention the upgraded seats. Last thing I want is to be stuck out on the lake pulling my 8'x16' Yetti, and wishing I had the lockers. So far the only real disappointment with the machine is the paint job on the frame. Seems like most of the weld joints on the frame have a crack in the paint with rust starting in. ?? Attached is a pic of what she will look like with the Cab. Last edited by willyg1997; 04-02-2019 at 10:52 AM. For those of you who have the XT air intake system, do you see a lot of dust and more important SNOW from the tires or tracks in your engine bay, potentially sucking snow into the air intake located just above the air box? I understand that the XT CVT intake mounted on the side just below the box has an issue with snow plugging it up, and routing the intake to the cab would help. Not sure I want to be sucking air from an enclosed heated cab. 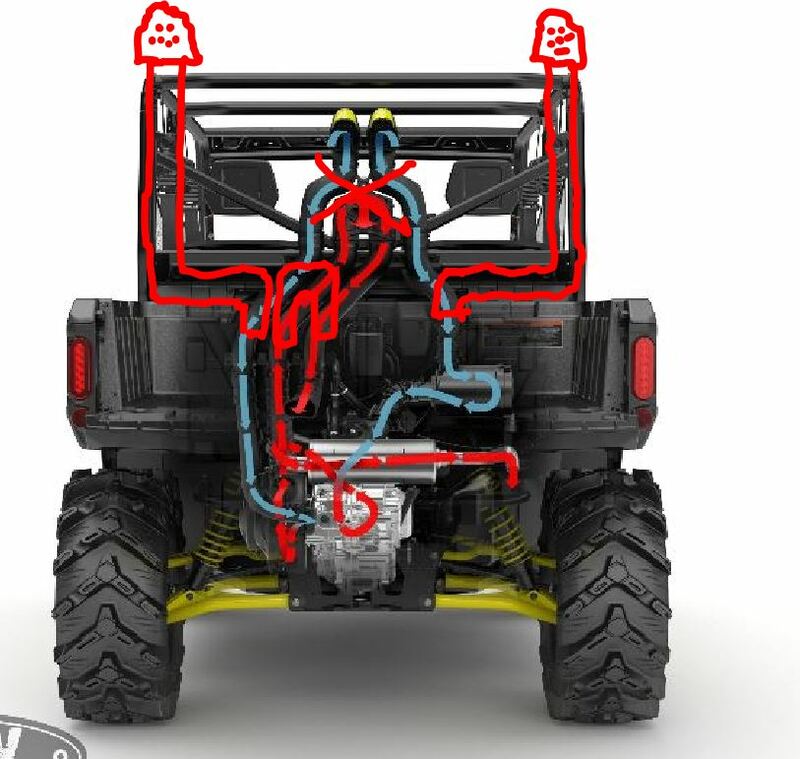 Right now I am trying to figure out what I am going to do with the snorkel intake for the Engine and CVT air intakes. The XMR snorkel location isn't going to work with the Topper that will be getting installed (sliding window in the cab and topper). I am hesitant installing the stock XT Engine and CVT intake system, as the engine bay seems to be a big vacuum for dust and blowing snow (maybe I am wrong). My thoughts are to run a new intake for both Engine/CVT across the bottom of the rear window, than up to the top of the roof running vertical along the side of the window, and remounting the snorkel intakes above the roof next to the cargo rack. Getting the air intake up above the blowing snow. Last edited by willyg1997; 04-02-2019 at 10:55 AM. I would think you would be able to go with the CVT Air Intake Relocation Kit (715004183) which is required when you run tracks. 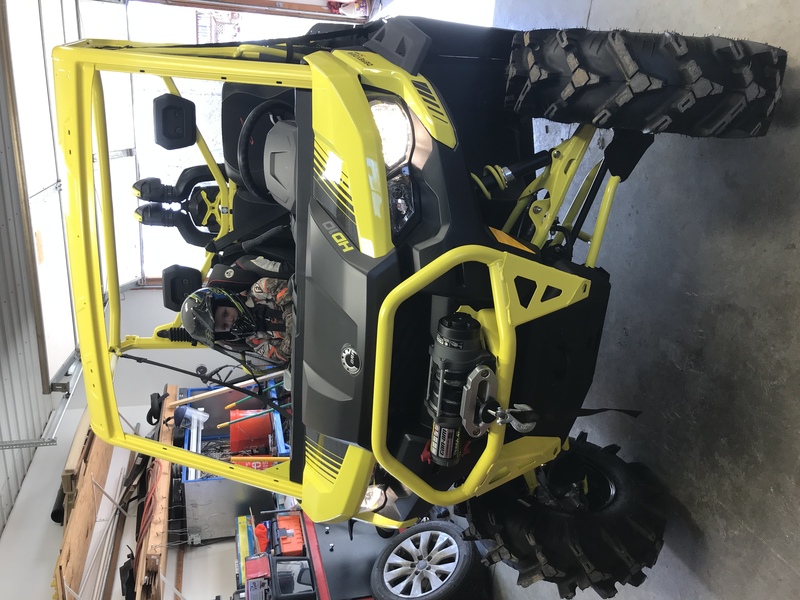 In the Can Am accessories catalog it says that kit is available on all models except for the XMR, but I wonder if you could remove the snorkel intake for the winter and make that work??? After all, the XMR style snorkel kit is available for all the other models of Defenders, so it seems to me that that kit would work if you remove your snorkel for the Winter. Also, if you remove the snorkel kit for Winter, you wouldn't have the rear window fitment issue that some have described and the sliding rear window would be much more useful without the snorkel in the way. One thing to note about the Apache Tracks is that they are actually Kimpex WSS4 tracks but with that silver cover plate. You can find them for about 4k through some sites online, but as the dealer reminded me, that does void the warranty since they considered aftermarket. On another note, I wonder if you are going to have to use some kind of extended hitch if you are pulling your fish house with the tracks on given their footprint?? ?